It's Tag It Tuesday with My Creative Time, and today I tried out my new We R Memory Keepers Photo Sleeve Fuse Tool to make a shaker tag! This is definitely the easiest way to make a shaker! 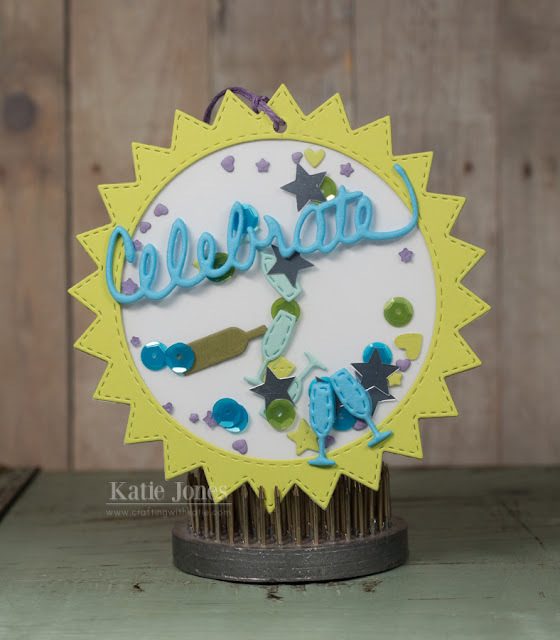 I started by making my lime green frame with a circle die from Bunch of Fun Circles and one of the Stitched Starburst Dies. Then I made my clear pocket. I have a bunch of We R Memory Keepers 12x12 Page protectors that came with an album that I use for Project Life, so they will be perfect to use with this tool. I took the same circle die and fused around the outside, tracing the edge with the tool, about 2/3 of the way, leaving an opening to fill it up. I then trimmed the plastic pretty close to where it fused together. I filled the "shaker" with sequins and little die cuts. The hearts and stars were made with dies from Hello Baby and 4x4 Journal Die + More. The champagne glasses were made with a die from All Around Holidays, and I used a die from Way to Go for the wine bottle. Once it was all filled up, I fused around the rest of the circle die. I die cut a solid white starburst for the back of the tag and adhered it, the shaker, and the lime green frame together with Ranger Multi Medium Matte. For the top of the tag, I used some craft foam and die cut a couple more champagne glasses, plus "celebrate" from Stitched Rectangular Frame Dies & More." The nice thing about making a shaker this way is that the inside elements don't all fall straight to the bottom, so they spread out more, but you can still shake them. OMG Miss Katie Love your shaker tag...love too all the cool ways you used Miss Emma's goodies and I know isn't the Fuse awesome....I got it too....you definitely did an outstanding creative job. YOU so ROCK!! I have to agree this is a faster easier way to make a shaker tag. I love all of the items you put in it...good use for those very small die cuts. Wonderful job. Gorgeous shaker tag!!! LOVE the colours!! !